Genealogists spend years getting to know their sources. We learn the ins and outs of archives and their collections of genealogical records, looking to get the maximum amount of information on our ancestors. In combing through the Philadelphia Inquirer newspaper archives I noticed that they ran a regular feature called the “Birthday Bulletin,” starting in 1903. Generally these newspaper birthday announcements ran on page 2 or 3 and included a brief biography and an etching or photograph of the featured person. In this example, published 24 October 1903, page 2, an Israel W. Durham is featured. The newspaper article includes his photo, and a brief biography gives us his date and place of birth: “He was born in this city (Philadelphia) October 24, 1856” along with a sketch of his public service and a portrait etching. 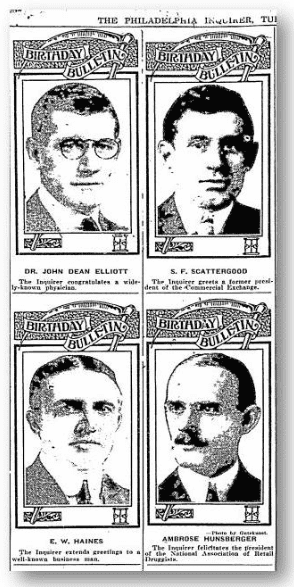 Some of these shout-out newspaper birthday announcements are much briefer, like the following four-panel “Birthday Bulletin” published 29 August 1922, page 3, which featured the birthdays of four area businessmen. In this example we can get their date of birth, occupation and a photograph. It can be very difficult locating a photo of our ancestors so it is a real plus when they were published in a newspaper. These “Birthday Bulletins” focused on acknowledging the birthdays of established business and public figures in the community. 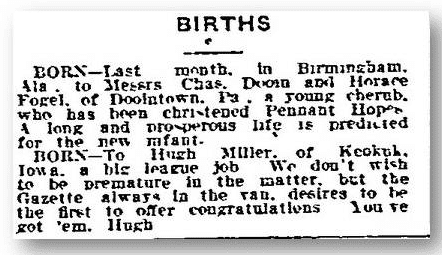 The Philadelphia Inquirer also routinely published “Births” announcing the arrival of newborn infants, such as the following birth announcement, published 5 April 1911, page 10. We expect newspapers to publish information about the area’s births, marriages and deaths. It is a bonus when a newspaper creates an additional local interest feature like these “Birthday Bulletins” that is so helpful to genealogists. When you approach the old newspapers for your local area, take the time to become familiar with them. Flip through the newspapers and see what features were unique to that paper. Doing so can help you uncover hidden gems to aid in your genealogy research. The newspaper is your friend—get acquainted. In my experience we can find genealogical information throughout a newspaper, from the front page to the classified ads.